Step 2: Enter computer on the Search field and press [Enter] key. Step 3: Right-click on Computer and select Properties. Step 4: Select Change advanced system settings. Step 5: Select Computer Name and click Change button. Step 6: Enter a Computer name and should be your WORKGROUP for ex:(myhome, sales etc)name then click OK. 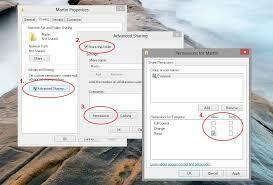 Step 2: Network Sharing Center window opens -> on left hand side click change advance sharing setting. Step 2: Folder Option Window appears -> click second tab (View Tab) -> scroll down unless you find Use Sharing Wizard this is should clicked. and now you are good to go to share your folder between Windows 8 computer….. This entry was posted in Shared Folders and tagged File and Printer Sharing, Network Discovery, Network Sharing, Select Computer Name, Simple File Sharing.